July 4th marked the 16th Anniversary of the formation of our organization – The US Committee for a Free Lebanon. Plenty has changed since then but plenty still remains the same. The general state of our beloved homeland does not call for much celebration. Our puppet regime is a government that is still a tool in the hands of the Syrian intelligence services, Hezbollah and the mullahs of Iran; our parliament is appointed and not elected; our legal system is rotting with bribery and corruption; our democracy is ceding to autocracy, and the majority of the Lebanese population still lives in a state of denial partying all day long like if nothing ever happened. It is crystal clear to everyone by now – unless you are blind or plain stupid – that unless and until the Syrian regime of Bashar Assad is totally dismantled, Hezbollah is put out of business and the Iranian ambitions contained, Lebanon is going nowhere….absolutely nowhere. Neither the Lebanese Army nor any Lebanese force inside or outside the country is or will be able to liberate Lebanon from under the shackles of terrorism until the above factors are taken into account. Period. In the meantime, what are we as free spirited Lebanese – both in the Diaspora and Lebanon – to do? As a start, it is high time to start telling the world to stop messing with us cause we are not going to take it anymore and to do all we can to undermine the Assad regime and its influence in Lebanon. It is also way overdue to lobby for putting the Assad regime out of business once and for all unless you want to see another 500,000 victims in Syria, an ever growing flow of Syrian refugees in Lebanon and a complete loss of the Near East to the Iranian mullahs and their proxies. You don’t cure cancer by applying band aid but only through a surgical operation. If you don’t know this by now then I am afraid you know nothing about Foreign Policy. I am not running for elections anywhere. All what I am seeking is peace and prosperity for millions of Lebanese and Americans alike and terrorism hinders capitalism. Period. 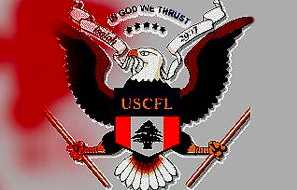 I personally founded the US Committee for a Free Lebanon (USCFL) on July 4, 1997 along with 56 prominent Lebanese American activists and financiers, to educate the American public as to Lebanon’s strategic and moral significance as an ally of the United States and an outpost of Western values in the Middle East. Just to set the record straight …. We are NOT a front of any foreign entity; whether Syrian, Israeli or whatever. Most importantly we are not affiliated with any political faction in Lebanon or abroad and are funded solely by our members, supporters and other constituents. We are neither right wing nor left wing. We are neither Republicans nor Democrats. We are neither neo-cons nor doves. We are just the ultimate lobbyists and powerbrokers for a Free and Democratic Lebanon. We are here to promote BOTH American and Lebanese interests and make it a “win-win” for both. We only advocate the use of force if and when needed and only as a last resort for the simple reason that the only language some terrorists out there understand is the use of force. We hold that the United States has vital interests in the Middle East and see the region, with its profusion of dictatorships, radical ideologies, existential conflicts, border disagreements, political violence, as a major source of problems for the Free World. Toward this end, we seek to help shape the intellectual climate in which U.S. foreign policy is made by addressing key issues regarding the region in an accessible way and for a sophisticated public. We function as a resource for individuals and institutions seeking not only accurate and reliable information, but also new and fresh perspectives, combined with innovative and effective solutions, for Lebanon and the Lebanese people. Consequently, we serve as a vehicle to disseminate “intelligence” and “out-of-the box” ideas to institutions and policymakers in the United States and abroad that are capable of exercising political, economic, military or spiritual leverage to bring abuses towards Lebanon to an end and hold those responsible to account. We believe Lebanon is a pluralistic country with people of many religions, ethnicities and beliefs. In recognition of this reality, we advocate only solutions for Lebanon upon which genuine consensus can be built, irrespective of race, creed, religion or ethnicity. In other words, we believe that in order to find a basis for peace, prosperity and security in Lebanon, we must begin by emphasizing and focusing on issues upon which all Lebanese of good will, Druze, Muslim and Christian, can agree. We condemn all forms of bigotry and racism, including anti-Arab racism, anti-Muslim and anti-Christian hatred, anti-Semitism and anti-Americanism. We believe that all people in the Middle East deserve the right to be heard, as well as the right to own property and the right to basic liberties of speech, religion, the press, and assembly without fear of terrorism or retribution from states or fanatical organizations, seeking to forcibly impose their will on peoples of different beliefs and backgrounds. We support the right to self-government and self-determination for all the diverse peoples in Lebanon and the entire Middle East, as well as the right of these peoples to live securely and in tranquility anywhere in the region. We are an organization committed to the fundamental values of Constitutional Democracy, which alone are able to bring genuine stability, prosperity, peace and security to Lebanon. Therefore, we use all the resources at our disposal to promote the universal principles of free enterprise, limited government scope and involvement, individual freedom, strong and positive religious and traditional values, and an independent and sovereign government with a strong national defense for the nation of Lebanon and its beleaguered people. Hence, and to facilitate our fundamental goals, we strongly believe Lebanon should work to forge new regional alliances in the Middle East, as well as global alliances abroad, with nations and institutions that share these fundamental values of freedom and Constitutional Democracy. 1. Lebanon is an independent and distinct nation that has the absolute right to be free from Syrian, Iranian or any other occupation; directly or by proxy. 2. US interests in the Middle East are best served by a free and democratic Lebanon. 3. Lebanon must be a partner to, and not an object of, any Middle East peace process. 4. The human and civil rights of the people of Lebanon must be upheld. 5. The cause of peace, reconciliation and economic cooperation in the Middle East, based on mutual respect, justice and recognition of rights of all states and peoples to be free from the threat of war, must be achieved in accordance with the Charter of the United Nations. Come join us in being a part of decisions that will shape Lebanon and the Middle East’s future and please wake up ….. It is high time.